Abstract: Reflecting the growing interest in understanding the role of partnership brokers, the author reports on the outcome of a PBA organized workshop where a group of partnership brokers gathered to explore their role in the review and evaluation of partnerships. The discussion focused around a framework proposed by the PBA on the four different types of roles a partnership broker can perform. As part of its research (‘Learning’) and advocacy (‘Transforming’) activities, PBA’s Learning Community of Practice (COP) organised a one-day workshop in May 2013. Hosted by King’s College London, the event was attended by 21 participants from the London area and from Europe. It also served as the opportunity to launch the Learning COP and PBA’s Advancing Practice Workshop (AP) Series. From the start, the discussion was interactive and dynamic which was testimony to the keen interest in the topic and relevance to participants’ individual work as internal and external brokers. Opening remarks by most participants suggested they struggle with how to practically incorporate review and evaluation into their work. Interest in the brokering evaluation theme for some participants was motivated by their view that reviewing the broker’s role in partnerships was breaking new ground. Build a picture to share more widely with other partnership brokers in the Association’s alumni networks and worldwide. The day’s agenda logically moved through a review of the current status of PBA’s own thinking and activities into enquiry about the impact/added value of partnership brokering on collaborative relationships. 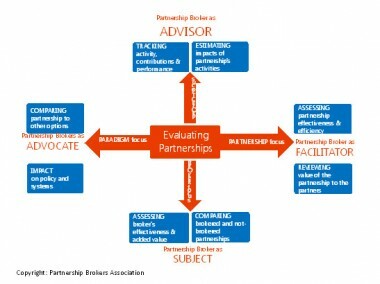 It was an opportunity for the PBA to introduce the participants to its Four-point Framework for Evaluating Partnerships (see the diagram), which described the diverse roles that brokers can be called upon to help fulfil different evaluation requirements. The Framework identifies the role of the broker as subject or focus of the evaluation, as an advocate for paradigm change, as an advisor and as a facilitator. The focus of the partnership will determine both the broker’s role and the evaluation focus. For example, if the role of the broker is to help partners review their partnership or evaluate its effectiveness his/her role would likely be facilitative in nature, supporting the partners to plan and assess the extent to which they are achieving their partnering objectives and the partnership relationships. Alternatively, if the partners wish to understand the value of brokered partnerships relative to other options or to understand the impact of their partnership on systemic or policy change, the broker would tap more into their broader knowledge and experience of partnerships for sustainable development to advocate the benefits and impacts of evaluating partnerships as a paradigm. The Framework can be used by partners and brokers in different brokering contexts , for example, in defining and negotiating the broker’s role, planning a review or evaluation of a partnership, identifying specific partnership outputs around which to measure the broker effectiveness, defining areas to evaluate the broker’s effectiveness in partnership building for a job description, or defining baseline information to be gathered for the partnership. The participants at the workshop worked with the framework for the remainder of the day. The first activity was a mapping exercise in which small groups discussed how the four-point framework resonated with their own experience. The discussion resulted in a number of tools and methodologies – including stories, log frames, performance score cards, needs assessment surveys and baseline data collection – which participants felt could be used in evaluation. Three practical tips also emerged from the discussion: (a) never push a ‘pro-brokering’ agenda; (b) it is important to always adhere to the key partnership brokering principles of equity, transparency and mutual benefit; and (c) be clear about terminology. 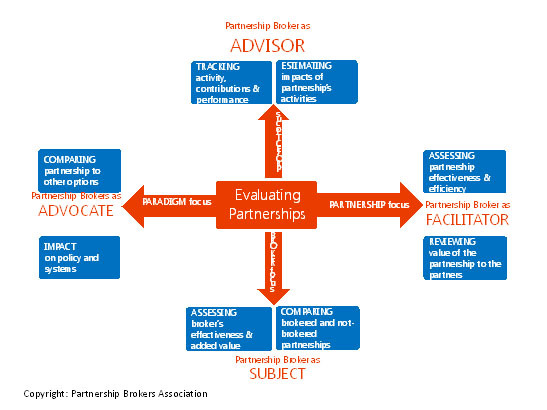 Why is this evaluation area important for a partnership broker? What methodologies/tools/approaches already exist for a partnership broker to work with? What’s missing? What do we need to know? What new ideas do we have for partnership brokers in this area of evaluation work? How will we know if our partnership brokering evaluation interventions have been successful? As anticipated, the carousel exercise generated a wealth of creative and useful new ideas which were shared in plenary, leading to a reflection exercise on the day’s outputs and next steps. These are summarised in the workshop report that includes a set of actions that individuals could take, actions for PBA and actions the Learning and the Training COPs could consider. The day’s discussion affirmed the high level of interest in brokering evaluation and gave PBA an endorsement to continue to build in this work stream. All participants concurred that there is more work to be done to provide better evidence and to build a robust knowledge base on broker effectiveness and impact. Furthermore, this work should be undertaken as a PBA wide initiative. The PBA is keen to connect with partnership brokers and others with an interest in partnership brokering as a role and as a paradigm, especially around addressing the action points in the workshop report. If you are alumni of the PBA training programme, you can also get involved-work with the Learning or Training COPs, providing you with an opportunity to document and share your own research or evaluation experience with other PBA alumni and contribute to the PBA Journal. 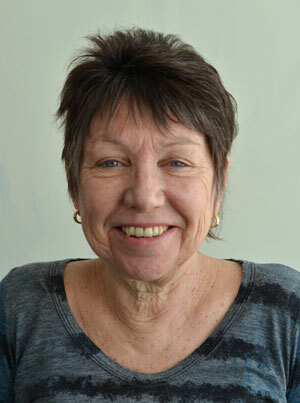 Joanne is a PBA Accredited partnership broker. Her career has focused on international development and humanitarian action, working with the U.S. Government, the United Nations and with international non-governmental organizations. She served for ten years with the Office of U.S. Foreign Disaster Assistance (OFDA) as the regional representative for the South Pacific and the manager of OFDA’s Global Disaster Management Training Programme. For the United Nations, working with the Bureau for Crisis Prevention and Recovery, she led the redesign of the UN Disaster Management Training Programme (UN DMTP) to be an inter-agency initiative of UNDP, UN ISDR and UNOCHA focused on capacity development for disaster risk reduction –CADRI. She currently works with the Humanitarian Futures Programme, King’s College London as their Partnership Manager.